*Hover over the image to view feature descriptions. Predictive text enabled for fast user selection of the Vehicle ID (Registration) which is not mandatory on Pre-Entry. Users can Clear any existing Vehicle (and Hauler combination) with use of the Space bar on this field. On Vehicle ID Selection the Hauler, Vehicle Configuration and Calculation fields will all be defaulted as per vehicle setup. ID’s can be Setup (on the fly) using the New ID button. With successful New ID creation this ID is then defaulted back into the Pre-Entry and Onsite windows for continued transaction processing. Hauler means transport or logistics company being used to load profit centre (Site) product. Pre-Entry is about planning where users need only record what is known i.e. Operators may know the customer and order but not the products being taken and/or the transport company being used. There are numerous combinations of what operators may or may not know and the specific vehicle ID is the most unlikely during the planning phase, hence the default value on opening Pre-Entry is the Hauler field. Predictive text enabled for fast user selection looking up the Hauler (Alpha) field value. On user selection of a Hauler, vehicle ID selection is automatically limited to the Hauler value selected. 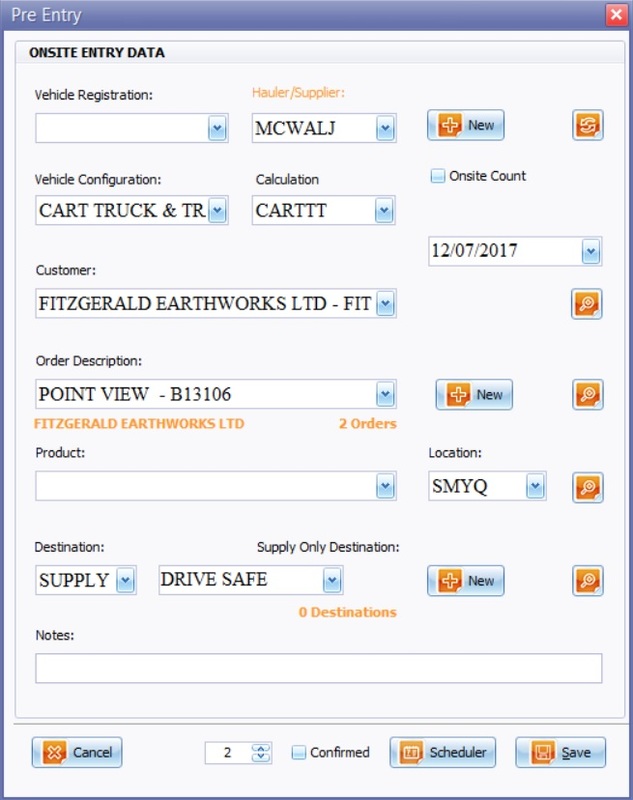 When a Hauler is a transport contractor (or Supplier) to the profit centre, (or Site) users will see the Hauler Label updated to being reported in orange Hauler/Supplier. The design of the Vehicle Configuration, (VC) field, is for describing the physical vehicle configurations; e.g. Truck, Car, Artic, Tractor and/or Trailer and/or any related combinations. The VC field defaults the Calculation field which is used for Cartage (transport) price and cost calculations. Vehicle Configuration is setup within the Products window as a Cart Type product and setting this radio button as True. vehicle ID creation each ID is linked and set with a default VC value. The Vehicle Configuration (VC) Combo Box field is selected and linked to each vehicle ID on user, vehicle setup defaulting this value on ID selection within the Pre-Entry and Entry windows. The Calculation field will take effect to determine the Cost and Price of transport only when a Destination (Supply and Deliver) transaction type has been user selected. Supply Only transactions have no cartage (transport) cost or price values and therefore the Calculation field has no function or purpose for Supply Only transactions. The Calculation field supersedes the Vehicle Configuration (VC) field cost and price values and is defaulted as a match to the VC field. The Vehicle Calculation field is True, (user available for selection) for all Cart (transport) Type products and is setup within the Product Maintetance window. Customer Selection is predictive text enabled on Customer Code. Customers are Setup with Administrator privileges only in the Customer Maintenance window. Order selection is predictive text enabled for fast user searching on Order Description. Order selection is defaulted on customer selection. The last Order created (Date and Time stamp) will be the first Order defaulted. Order Count reported in orange offers users a snapshot of the total orders/jobs existing within the profit centre on customer selection. On Order selection where the Order has a Price book linked the Price book Description is displayed in orange to the left of the Order Count label. Orders without an assigned Price book (reported in orange) are communicated in dashes _ _ _ which is a result of no price book having been assigned or linked to the Order or the Price book assigned to the Order has Expired or been Closed. Order selection concatenates the Order Description and unique Order Code. Orders can be set up on the fly, using the New Order button and are optionally assigned with an Order specific, Price book product pricing. Orders can be investigated, queried and edited using the Magnify (enquiry) button. Product selection is that of a Rock (or Waste) Type product only, setup with the Product Maintenance window. Product selection is predictive text enabled on Product Code. From Location selection is automatically defaulted to the primary profit centre location with options allowing product sourcing from more than one location (if applicable). When Destination is True this configuration communicates a supply and transport delivery Transaction Type. The Destination combination of fields offers users two types of transport configurations being Supply Only or Supply and Deliver. Supply and Deliver is used when the profit centre (Site) offers transport (cartage) as a complimentary product or service to the sale of rock or other materials. When Destinations are True, set by users, this transaction will have a transport (cartage) cost and price. Configurations allow for the profit centre to employ a sub contracted Hauler (or transport supplier) to deliver product on the profit centres behalf. When Supply and Deliver is True users will have set up a Destination and at a minimum, recorded a cost being what the profit centre pays the Hauler for transport to this Destination. Destination customer pricing can be set up at a ‘Location to Destination’ level which is superseded by Order, Price book pricing. Destinations can be set up on the fly, from within the Pre-Entry, Entry and Exit windows using the New Destination button, and on doing so the destinations saved are defaulted back into the window from which the process originated. Destination Count reported in orange, offers users a snapshot of the total count of customer destinations available for selection which remains subject to Hauler, Vehicle Configuration, Calculation and Product Location field, combinations and values. Supply Only means customer or hauler, product or material pick up only, and as such these transactions are without transport price and cost to the profit centre. Predictive text enabled user searchable and stored, recalled per profit centre. Supply Only is the default setting on Pre-Entry and Entry creation. The Supply Only Destination Description field defaults ‘N/A’, ‘Supply’, ‘Drive Safe’ or any value being User-defined Setup within Tools, Options Settings User tab and grid. Offers users a Text type field and is used for the benefit of customers e.g. Any customer purchasing product might be purchasing for any other customer that is not a customer of the profit centre and it’s here that the Supply Only Destination can be used to record a Destination or Customers’ customer destination that is identifiable to them. Notes creation enables user notes for any transaction (Pre-Entry, Entry, and Exit) with the Print Notes option determining whether these notes are to be printed on dockets. 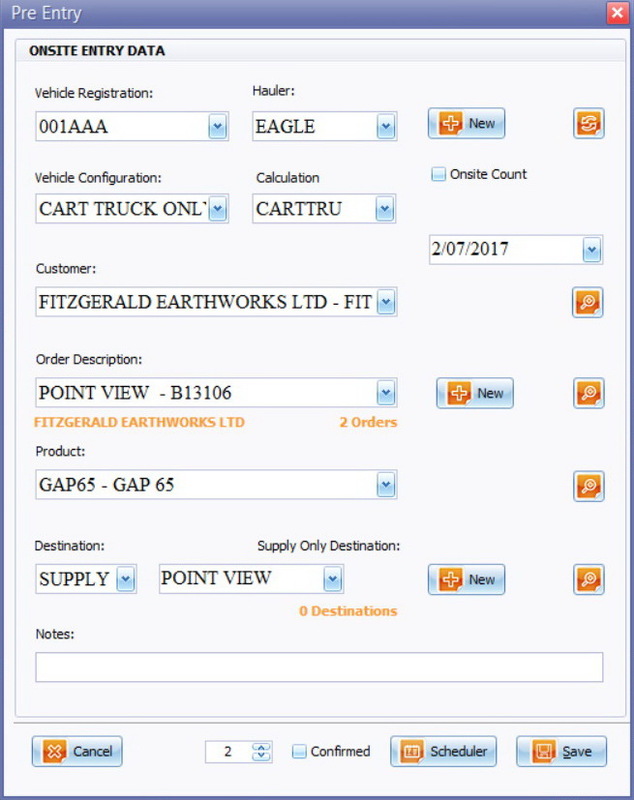 New buttons aligned beside the related fields of Vehicle, Order and Destination enable users to create these records on the fly. On doing so successfully, and using the bottom save button within each corresponding Maintenance window defaults the new values created back into the Pre-Entry, Entry or Exit windows. Transaction Recall is designed for seamless Pre-Entry and Entry of vehicles On-run. On-run means Haulers are transporting the same product for the same customer and order to the same destination more than once. Transaction Recall is not automatic (as it exists for Entry Onsite save) because Pre-Entry can be created for future weeks even months and the last transaction saved ‘Today’ is not necessarily applicable or going to be for future dates. Where Today’s transaction for one vehicle ID is going to be the same as tomorrow and the day after (hence the term ‘On-run’) users can input the vehicle ID and use F3 as the quick key to trigger Transaction Recall on Pre-Entry. Transaction recall is triggered only with ID selection. On selection of the vehicle ID creating New Entry (Onsite) all data is recalled as per the last transaction saved. Recalls the last transaction saved and its original values for the vehicle ID and doesn’t recall Edit-Exit values of the ID. Does not recall the Onsite Count being True or False, Fixed Price being True or False; Tare weights and is not available on Edit-Exit. Users can can choose to apply the Transaction Recall function on creation and edit of Pre-Entry and Onsite records. F3 is the quick key. The Onsite Count radio button is employed by profit centres that are limited by Council or Land Use restrictions. Such restrictions are based on Movement Counts e.g. A truck and trailer entering and exiting the profit centre is a single Movement under Resource Consent but when the truck is picking up one product for the truck, and another for the trailer described as a Split Load, both the truck and trailer Vehicle ID’s are required to have a stored tare weight recorded separately, creating two vehicle movements and docket counts, but as per Resource Consent equates to just one Movement Count. The default value is False meaning the transaction is added to Movement Count totals. When the Onsite Count radio is True, the label is updated to ‘No-Onsite’ with a Description field opening. The purpose of the Description field is used to identify the reason why this transaction and/or vehicle is not added to Movement Count totals, for council or regulatory authority, reporting. The No-Onsite Description, Text type field and can be defaulted as per product setup accessed from the Products Maintenance tab. Users can set True the Onsite Count radio button creating a transaction that doesn’t add to Movement Counts which works to producing one of two reporting groups being that of Movement Counts versus Vehicle Docket Counts (or movement plus non-movement counts). A Trailer Only Vehicle Configuration, setup as per the Products Maintenance window is typically set with the No-Onsite Count radio field as True because the most common reason for a Trailer Only transaction is that of a Split Load hence vehicle processing, via the Pre-Entry and Entry windows is defaulted to that of No-Onsite Count as True with the Description of ‘Split Load’. Pre-Entry Work Date functionality delivers planning and forecasting functionality throughout the application and when employed with the Scheduler button delivers logistics scheduling and management; in bulk, capability. Users can set any Pre-Entry Work Date and on doing so are recording today and tomorrow’s forward orders. Work Date defaults to Today’s date on New Pre-Entry. The Work Date field is a text type field. 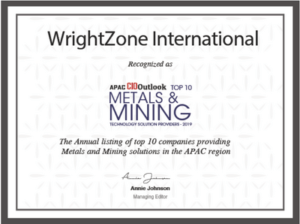 Key strokes of 10914 delivers results 10/09/14 offering efficient text type functionality. Users can View, Select, Edit and Report by Work Date within the Pre-Entry Planner and Dispatch Grids. The Pre-Entry Grid reports all Pre-Entry transactions for the current day only. The Pre-Entry Planner reports All Pre-Entry transactions for both past (not processed) and future dates. The Magnify Icon means enquiry and offers drilldown on the appropriate Master record user selected and each is aligned beside the related fields of Customer, Order, Product and Destination. On drilldown users can edit and save records. On doing so to the record is instantly refreshed and updated back into the windows from which the process originated being that typically of Pre-Entry, Entry and Exit. The Product Location field delivers multiple Locations with which to record product from and if applicable their cartage (transport) from Location to any Destination profit centre cost and price to customer in addition. Locations are setup within the Location Destination Setup (or Destination Cost and Price) window when the Location Edit radio button is set to True. The default Location Code is always a match to the Profit Centre Code. All Products can be set to have Cost and Price by Location default value (often reffered to as being your List Price). When a transaction type is Supply and Deliver Cart type products are set with a Price and Cost by Location to Destination. In order to view or select a product from the Product field within the Pre-Entry, Onsite and Exit windows a product must be set with a Product and Location combination price or cost. Where a Product and Location combination are set to blank (which is the default value on New Product setup) this product will not be available for Pre-Entry, Onsite and Exit window selection. The Location field is only available for user selection where multiple locations have been setup of any one product. A feature in offering multiple locations is to provide and provision for product out sourcing. Profit centres can purchase product from another profit centre, for the customer (including cartage or transport delivery). Users can set other locations e.g. OTQ (Other Quarry) recording the location purchase price (being a profit centre cost) and customer sell price. Users can create multiple From Locations for any one product; each location offers the ability to record a cost and price whether these are Pits or Lots inside the profit centre or reference other profit centres (Sites) owned or not by your Profit Centre. The Scheduler button will Save the pre-entry transaction, close the Pre-Entry window and open Event Recurrence window initiating the forward order logistics or transport scheduling plan. The default start date for the recurrence pattern is determined by the Work Date set within the Pre-Entry window. When users edit a pre-entry transaction (from the Pre-Entry Planner or Main Pre-Entry grid) and it has been scheduled the Scheduler button is updated to the View Event button (above) and where it forms part of a recurring event users with have the choice of opening the events single occurrence as the default option or the entire Job Run, Event Series. The Recurrence Quantity is the quantity of recurrences for the one pre-entry transaction. The system default is a quantity of two being the minimum quantity required to enable a recurrence (meaning to happen or occur again repeatedly). The Recurrence Quantity will match the Event Recurrence quantity on click of the Scheduler button where it can be edited by users. When users are wanting to schedule the one pre-entry transaction only then from inside the Event Recurrence window click Remove Recurrence offering single occurrence scheduling. Confirmed is the means to communicate to all users that the forward order and accompanying transport or logistics scheduling plan is definitive. The opposite of confirmed is tentative which is the default status of pre-entry transactions allowing users to record either a Hauler or Customer value within the pre-entry transaction and in doing so are tentatively reserving or, at a minimum acknowledging the forward order. When pre-entry transactions are confirmed the pre-entry transaction is reported within the Percentage Complete report which is used to assess internally, the performance of any Hauler or Customer. When a pre-entry transaction is Confirmed the Event Dialog is reported in bold. When a pre-entry transactions is Confirmed its added to the Percentage Complete report for Hauler or Customer performance monitoring. When a pre-entry transaction is Confirmed it cannot be set or undone to a status of Tentative. A pre-entry transaction can only be Confirmed when its scheduled. Hauler means transport or logistics company being used to load profit centre (Site) product. Pre-Entry is about planning where not all information is known as example operators may know the customer and order but the products being taken and/or the transport company being used is otherwise unknown. There are numerous combinations of what operators may or may not know and the specific vehicle ID being known unlikely, hence the default value on opening Pre-Entry is the Hauler field. The Onsite Count radio button is employed by profit centres that are limited by Council or Land Use restrictions. Such restrictions are based on Movement Counts e.g. A truck and trailer entering and exiting the profit centre is a single Movement under Resource Consent but when the truck is picking up one product for the truck and another for the trailer described as a Split Load, both the truck and trailer Vehicle ID’s are required to have a stored tare weight recorded separately, creating two vehicle movements and docket counts, but as per Resource Consent equates to just one Movement Count. When the Onsite Count radio is True the label is updated to ‘No-Onsite’ with a Description field opening. The purpose of the Description field is used to identify the reason why this transactions and/or vehicle is not added to Movement Count totals, for council or regulatory authority, reporting.